THE FLATS – Georgia Tech and adidas revealed the Yellow Jackets’ 2018-19 men’s and women’s basketball uniforms as part of Live at the Thrillerdome at McCamish Pavilion on Friday evening. Georgia Tech men’s and women’s basketball will each feature three different adidas uniform sets in 2018-19 – white, Tech Gold and navy blue. 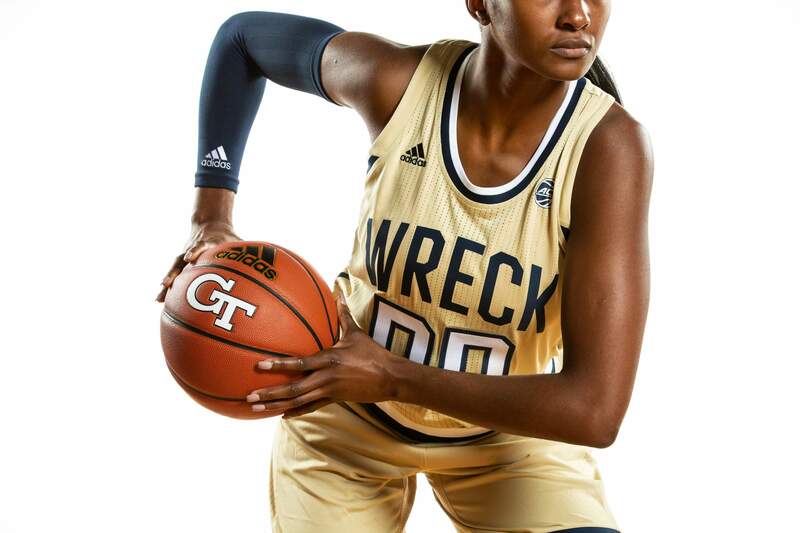 The men’s gold uniforms have the same navy blue wordmark on the front while the women’s gold jerseys feature “WRECK” emblazoned above the numeral, a nod to Georgia Tech’s famous “Ramblin’ Wreck” moniker. Numbers on both teams’ gold jerseys are white with navy blue trim. Both teams’ blue uniforms are a nod to the tradition of the Institute, with a clean look that simply includes the “TECH” portion of the wordmark prominently featured in Tech Gold above the numerals. The numbers are white with Tech Gold trim. All three uniform sets include Georgia Tech’s iconic interlocking GT logo on each leg and the Yellow Jackets’ secondary “Buzz” logo above the nameplate on the back of the jersey. Each uniform also incorporates piping on the legs, waist, shoulders and neckline that are a nod to the Jackets’ 1990s look and a set of “Stinger Stripes” on the side of each jersey that mirror the striping on Tech’s adidas football uniforms. Always at the forefront of design and innovation, adidas uniforms provide the perfect blend of style and technology for elite performance. Each Georgia Tech basketball jersey features recycled, engineered mesh to promote airflow and ventilation, as well as numbers with a perforated finish for lightweight breathability. The shorts are made from recycled knit fabric and feature terry panel wipe zones for moisture absorption and lightweight, breathable interlocking GT logos. In addition to the uniform reveal, Live at the Thrillerdome featured the 2018-19 Georgia Tech men’s and women’s basketball teams being introduced publicly for the first time, in front of a capacity crowd of more than 5,500 at McCamish Pavilion. The teams entertained those in attendance with a slam-dunk exhibition and shooting contests leading up to the unveiling of the new adidas uniforms and a concert by chart-topping hip-hop duo Rae Sremmurd. 2018-19 Georgia Tech men’s and women’s basketball season tickets are still available, beginning at just $360 for the men and $65 for the women. Men’s basketball ACC Packs are also now available, which feature tickets to all nine of the Yellow Jackets’ home games versus ACC opponents, including Louisville, Notre Dame and Duke. Nine-game ACC Packs at just $149. To purchase Georgia Tech basketball tickets, visit ramblinwreck.com/tickets.